We’ve locked a lot of people up since 1980, making the U.S. the world leader in prison population (both total and per capita), and the south the leader of the U.S. Locking up a lot of non-violent offenders, especially drug offenders, hasn’t bought us much safety and has caused a lot of problems. Washington, DC–Senator Jim Webb (D-VA) today introduced bipartisan legislation to create a blue-ribbon commission charged with conducting an 18-month, top-to-bottom review of the nation’s entire criminal justice system and offering concrete recommendations for reform. Senator Arlen Specter (R-PA), Ranking Member on the Judiciary Committee, is the principal Republican cosponsor. You can follow the progress of S.714 online; it’s currently before the Senate Judiciary Committee. America’s criminal justice system has deteriorated to the point that it is a national disgrace. Its irregularities and inequities cut against the notion that we are a society founded on fundamental fairness. Our failure to address this problem has caused the nation’s prisons to burst their seams with massive overcrowding, even as our neighborhoods have become more dangerous. We are wasting billions of dollars and diminishing millions of lives. We need to fix the system. Doing so will require a major nationwide recalculation of who goes to prison and for how long and of how we address the long-term consequences of incarceration. Twenty-five years ago, I went to Japan on assignment for PARADE to write a story on that country’s prison system. In 1984, Japan had a population half the size of ours and was incarcerating 40,000 sentenced offenders, compared with 580,000 in the United States. As shocking as that disparity was, the difference between the countries now is even more astounding–and profoundly disturbing. Since then, Japan’s prison population has not quite doubled to 71,000, while ours has quadrupled to 2.3 million. The United States has by far the world’s highest incarceration rate. With 5% of the world’s population, our country now houses nearly 25% of the world’s reported prisoners. We currently incarcerate 756 inmates per 100,000 residents, a rate nearly five times the average worldwide of 158 for every 100,000. In addition, more than 5 million people who recently left jail remain under “correctional supervision,” which includes parole, probation, and other community sanctions. All told, about one in every 31 adults in the United States is in prison, in jail, or on supervised release. This all comes at a very high price to taxpayers: Local, state, and federal spending on corrections adds up to about $68 billion a year. Our overcrowded, ill-managed prison systems are places of violence, physical abuse, and hate, making them breeding grounds that perpetuate and magnify the same types of behavior we purport to fear. The U.S. criminalizes conduct that would be better left to treatment and penalties other than imprisonment. Take drugs. The number of jailed drug offenders has soared 1,200 percent since 1980 despite the fact that many of these offenders have no history of violence or high-level drug distribution. Many are behind bars under sentencing guidelines that leave judges no choice. In another example of dubious penology, too many mentally ill people are treated as miscreants or felons rather than as patients in need of treatment. There are four times as many mentally ill people in prison than in mental health hospitals. Many of these individuals end up back on the streets. This is not about people convicted of violent crimes. We need to make sure that dangerous criminals and second-time offenders with a history of violence go to jail. As a former prosecutor who served two terms as D.A. in Philadelphia, I’m a strong proponent of incarcerating violent criminals for public safety and deterrence. And I support the death penalty in especially egregious cases. But I also believe we need to restore judicial discretion in low-level drug cases and other nonviolent crimes. With our federal prisons at 140 percent capacity and with 7.3 million Americans incarcerated or on probation or parole – a number equivalent to 1 in every 31 adults – the issue cannot wait. The question we started with, jail deaths in Lowndes County jail, is only a symptom. The problem is much larger. Fortunately, we can do something about it. Georgia does not have a member on the Senate Judiciary Committee, but that means there’s no reason not to contact any or all of the members of that commmittee. Here they are. This entry was posted in Economy, Incarceration, Lowndes County Commission, Georgia, Politics and tagged 111th Congress, Arlen Specter, Georgia, incarceration, jail, Jim Webb, judicial discretion, Lowndes County, National Criminal Justice Commission Act of 2009, non-violent offenders, Parade, prison reform, S. 714, war on drugs on April 13, 2009 by John S. Quarterman. 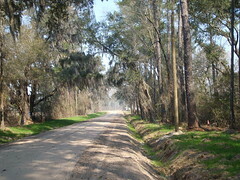 This entry was posted in Canopy Road, Lowndes County Commission, Georgia and tagged Georgia, Hancock., Lowndes County, paving, Quarterman Road, Reames, Scruggs on March 12, 2009 by John S. Quarterman. 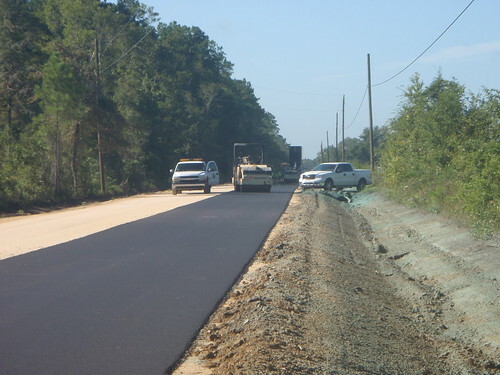 Expansion of Lowndes County Commission? Since a proposal for nine commissioners was voted down in the 1980s and the Justice Department required a minority-majority district, leading to the current three commissioners plus non-voting chair, there have been various attempts to expand the number of Lowndes County Commissioners. Thomas County has eight commissioners, as do several other nearby counties with less population than Lowndes County. For that matter, the city of Valdosta has I think seven city council members, for less than half the population of Lowndes County. The previous commission was divided among itself on this issue, and the local state representatives would not bring it up in the legislature without consensus among the commission. The new commission has been trying to move forward on this. The last version I heard involved keeping the same commission districts as now, plus adding two overlapping commissioners for new east and west districts. Paige Dukes, Lowndes County information officer, said the commission visited with reapportionment in Atlanta twice during the past few weeks. As a result of those meetings, the reapportionment office forwarded several maps to the commission for its review, Dukes said. Paulk was a guest of Scott James on his morning radio on program TALK 92.1 Monday, and in the course of that interview, Paulk said that if all the commissioners agreed on the plan, the expansion could actually be voted on by the board at tonight’s meeting. It’s not clear from that just what they might vote on, but from context maybe it would be to forward a plan to citizens to vote on. This entry was posted in Lowndes County Commission, Georgia, Politics and tagged Ashley Paulk, county commission, Georgia, Lowndes County, radio, Scott James, Valdosta on February 24, 2009 by John S. Quarterman. A new year brings Mayor Fretti’s State of the City address for Valdosta. It was quite interesting as an exercise in transparency: he walked through what seemed like every city department, one by one, in addition to talking about overarching cost-saving measures and emphasizing that Valdosta has no debt, not even bond debt. This was all good. I did think it was a little over the top when the mayor included in his welcome of new and old county officials that “all roads lead to Valdosta, the county seat.” Valdosta Aeterna! Well, Valdosta, unlike Rome, may not be eternal, but bickering between the city and the county apparently is. Also, as I mentioned to the mayor afterwards, I had hoped he would say a few words about the proposed bus system. He indicated that he had simply forgotten to do so. That’s understandable, considering all he did talk about. Next year. If you live in Valdosta, I understand you can view the mayor’s speech on local cable for some time to come. I recommend it. 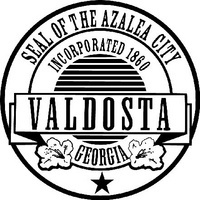 The full text is on the Valdosta city web site (yay! ), even though it’s in a hidden link (which I’ve dug out and linked in here) and in Microsoft Word (boo!) instead of as plain HTML. 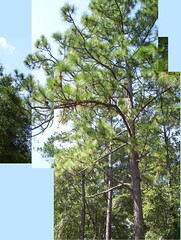 This entry was posted in Lowndes County Commission, Georgia, Politics and tagged Fretti, Georgia, Lowndes County, mayor, McKey Park, Moody AFB, Roma Aeterna, Rome, sports, state of the city, tennis, Valdosta, Valdosta Aeterna on January 24, 2009 by John S. Quarterman. A couple of weeks ago (Wednesday, Jan 7th, 2009), I went to a public meeting on a Transit Implementation Plan for the Valdosta Urbanized Area. Basically, where should the proposed Valdosta bus system run? 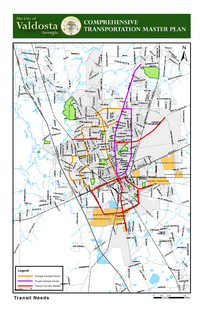 This is part of the Valdosta Transportation Master Plan. It was quite interesting that there was such a meeting, at which the various organizers (SGRDC, MPO, and the consultant) actively solicited input from the attendees, in both ad hoc and organized ways. First they gave a presentation and answered questions. Then they asked participants to fill out a questionnaire about where they lived, worked, and played. The presentation for that meeting is online. They even scheduled several more Public Involvement Meetings. Hm, I’m not seeing that schedule online, but presumably they’ll put it up before the meetings happen. There was pretty good attendance: several plain citizens, the mayor, a couple of city council members, a couple of county commissioners, at least one planning commission member, a member of the Zoning Board of Appeals, a newspaper reporter, etc. If you want a bus to run near you, I’d recommend going to one of these meetings, or contacting the organizer, Corey Hull, MPO Coordinator, 229-333-5277. 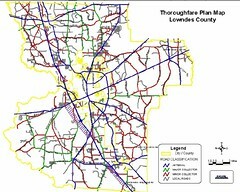 Lowndes County has a Thoroughfare Plan, which is currently being revised. We’ll see what the public input process for that turns out to be. This entry was posted in Lowndes County Commission, Georgia, Travel and tagged bus, Georgia, mass transit, Moody Air Force Base, Valdosta, Valdosta Transit Implementation Plan on January 22, 2009 by John S. Quarterman.